Recently a car was brought to us that was covered in concrete splatter... they were mixing and pouring concrete several floors up on a high rise building construction, and although the cars had been moved away from the site, the wind took fine droplets and dumped them as fallout onto this Audi. 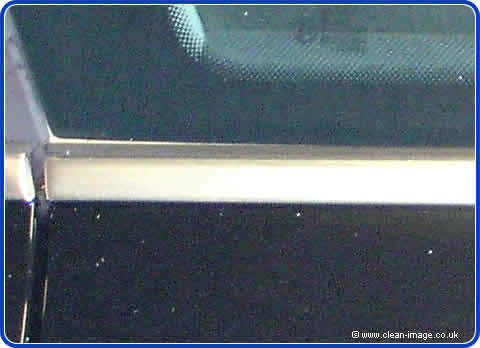 The photo above is a close up showing the fine cement splatter, it's not large lumps, but it covered much of the car. Cement can be pretty hard to remove as normal car care products and household products will either fail to touch it or damage your paintwork. Luckily, they brought the car to the right people - we have just the gear for this type of work. However, concrete was not the only problem as can be seen from the photo above. Just below the swage line (near the centre of the picture) can be a large dent. You can also see from the reflected light that the car is covered in fine scratches and holograms. 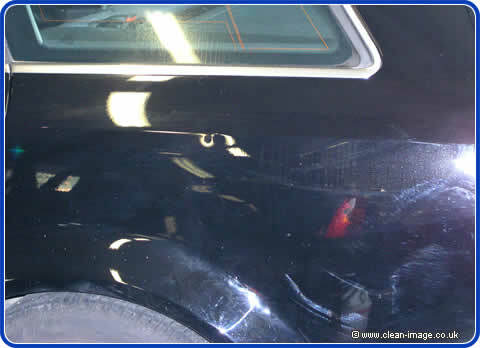 As these paintwork imperfections needed removing, we gave the job to Willy. So he set about washing the car down with a concrete remover and a firm sponge. Willy Winterfalk is on loan to us from Allbrite Europe and has flown in from Sweden to spend a 8 days to train our staff in the finer points of buffing cars. Find out today if your dent can be removed.